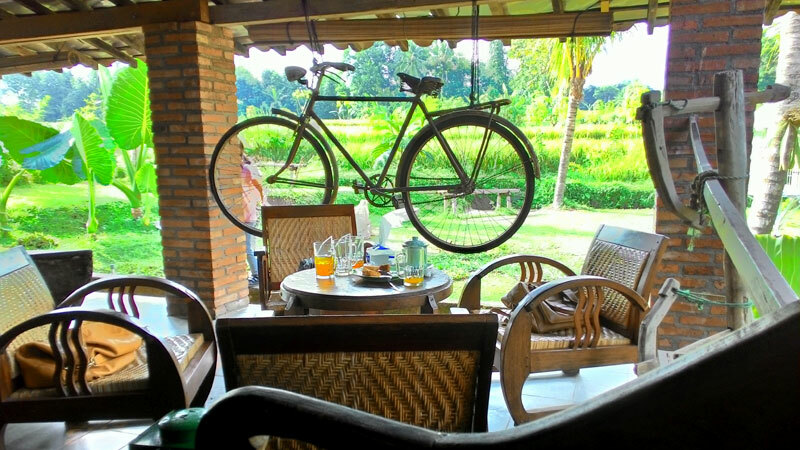 From traditional to modern places to visit, Yogyakarta offers many options. Wherever you choose, there is always a generous Local Host that can accompany you to do some fun activities. This city provides you a great adventure and also a lot of places to relax. Here’s a great list of Yogyakarta tour and day trips to help you get the most out of this cultural heritage city of Indonesia. You can enjoy a thick and sweet coffee of Sumatra in this place. Did you know that the barista in this coffee shop mixes their coffee in a pitcher without water? This process will make your coffee taste bitter. Only for the bravest! In addition, typical Indonesian fried banana is a loyal friend to this coffee. Because of its popularity, sometimes not all visitors can get their fried banana. Oh! We almost forgot to mention this place also provides a beautiful view of rice fields and a quiet atmosphere with its cool breeze. Borobudur Temple is one of the biggest tourist attractions in Yogyakarta. This temple is one of the world seven wonders and the biggest Buddhist site in the world. Whether the tourists want to seek a perfect travel memory or great photos, Borobudur Temple will always be the first option to visit. One of the best things to do in Borobudur is watching the sunrise. See the great sun coming out from Merapi Mountain when the beautiful red-orange color fill the clouds slowly while the Buddha statue silently brightens up. For the best way to enjoy Borobudur Temple doing it with a local host on Backstreet Academy is the best choice! After seeing the beautiful sunrise at Borobudur Temple, next, Boko Temple is the best place to watch the sunset. In this temple area, we can build a camp and enjoy the temple night atmosphere that is very quiet and calm. For the sake of complete experience from sunrise to sunset, we will bring you to find the best time to visit this temple when you join our Yogyakarta tours and day trips! In 2016, this coffee place became the location of filming one of the best selling movies in Indonesia that drastically increased its popularity. This coffee shop is well known for its coziness and their single origin coffee. 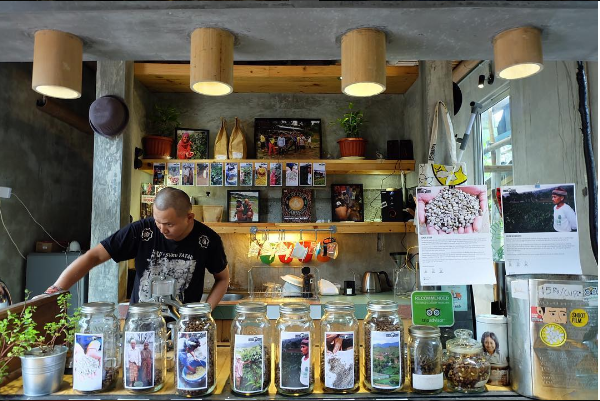 The barista as well as the owner of this coffee place is very friendly to visitors and won’t mind explaining the process of making coffee in detail to the visitors. Have you ever drank coffee with burning charcoal thrown into your glass? Weird as it sounds, it actually tastes pretty amazing! With that added roasted aroma and the sizzling theatrics, it adds such a special dimension to coffee, something you can only get in Yogyakarta. You can find Angkringan Kopi Joss everywhere from Tugu Yogyakarta to Malioboro Street, but often only at night as somehow Indonesians love to drink their coffee at night. 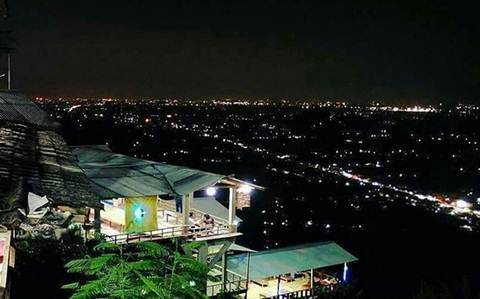 Bumi Langit is a restaurant at Yogyakarta that provides 100% organic foods. They don’t use anything that has chemical ingredients. Bumi Langit means Earth and Sky, the owner of this place believe that people should eat everything that earth and sky already provide for us. While visiting this place, you can also enjoy the view of organic plantation area. Did you know Obama visited this place in 2016? Taman Sari is a historical relic of Kraton, the royal palace, which now becomed a tourist site. This place used to be the royal garden and the place where the sultan had his baths with his queen, children, and concubines of choice. Taman sari sits on 10 hectares of land with around 57 buildings in the form of buildings, the bath, hanging bridges, and water canals. Read more about how the locals would bring you on a tour around the Taman Sari area and learn about great history of Javanese History! The South Sea is a popular getaway for people in the central cities of Yogyakarta and Solo, so there are tons of restaurants, activities such as horse-riding and even fishing in the area. It is also known for Lobster harvesting. You can even book a trip with a local fisherman on Backstreet Academy’s Fishing Adventure at South Sea and not only enjoy a unique experience but great hospitality from the locals who will cook the lobsters you caught after the trip! Javanese dance is a sacred dance that has great historical value. You can learn this dance directly from experienced dance teachers and also understand the spiritual philosophy of each movement. A long time ago only selected people were allowed to learn this dance and it was only performed to welcome The Sultan and his guests. Lucky for us, nowadays, everyone can enjoy and learn this sacred Javanese dance with a local on Backstreet Academy anytime. Jemparingan archery technique is very different from ordinary archery techniques; you will shoot while sitting cross-legged! Jemparingan is not only a sport and it’s not always about a competition, but also a discipline and a spiritually empowering exercise. Jemparingan will teach archers to control their feelings and train their concentration, focus, peacefulness, and patience. Once only reserved for royalty, now it’s open to all, and you can even book an experience with a Jemparingan master on Backstreet Academy! Check out also our National Geographic documentary about how we bring people together to experience this intangible cultural heritage of the world. Some Indonesians will say, “I would rather skip my meal if there’s no sambal in the menu.” Yogyakarta has dozens of sambal variations that can be found in every traditional and modern restaurant. Tempe is also a popular traditional Indonesian food; some people claim that tempeh is their favorite food that they should eat every day. What’s the best way to enjoy tempeh and sambal? Dip the tempeh into the sambal and voila! Ready to taste this perfect duo of tempeh and sambal? What better way than to do it yourself with a local homechef? Book here: Tempeh and Sambal Making Class. Milk Pie, Pisang Epek (Choco Banana), Terang Bulang, Es Buah, Indonesian Coffee… There are lots of interesting street food you can enjoy here in Yogyakarta. Yogyakarta will never make you lose your appetite to eat. The best way to take them all in with the recommendation of a local is through this urban culinary tour where you also cycle through the city and check out old colonial buildings dating back to the Dutch colonial period. 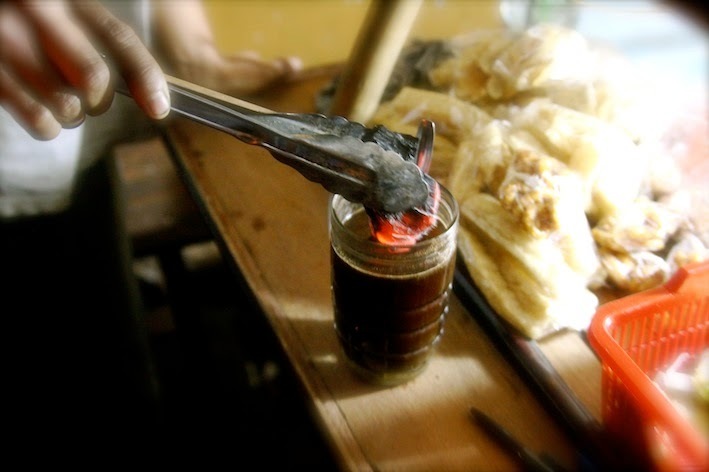 Kopi Luwak is one of the most famous (or infamous) food inventions of the world. Why? Because to produce a specific flavor of kopi luwak, raw coffee beans must first be eaten by the civet and then the faeces is what will be processed into coffee that you can enjoy. Interestingly, the taste is not what you expect, and even has a mild sweetness and deep aroma to it. The prices are correspondingly astronomical, easily costing more than 10 times that of normal coffee. So there are people who really swear by it! To get the inside scoop on how it is made and brewed, check out this Kopi Luwak Tour where an experienced local host will bring you around and how you secrets of this popular coffee! Epic coffee is quite appropriately named for it is one of the most epic coffeeshops we’ve been to in Yogyakarta! The location itself is also pretty epic, with a gigantic furniture warehouse integrated into the concept coupled with modern additions such as the huge glass facade and industrial lighting, it makes for a fantastic afternoon getaway from both the heat and rain (depending on the season) in Yogyakarta. Under a carpet of stars, Bukit Bintang is the best place to end your adventure activities before you return home. In Bukit Bintang, there are many small restaurants that have an outdoor concept so that visitors can chatting or just enjoying the night under a star-filled sky. Backstreet Academy's very own Backstreet investigators to all things good and great wherever you go!